I’ll be straight up: I’m not much of a gamer. Up until very recently, we did not have a console in our home and it was something I did not miss. But it wasn’t always this way. I grew up when video games weren’t much of a thing. I have a foggy memory of a friend getting an Atari in the late 70s (yeah, I’m that old), but video games in the home weren’t common. I grew up playing most video games in a smoke-filled arcade, digging quarters out of my dad’s back pocket while he chased the high score in 1942 bomber. My sister and I would always go through our allotment of quarters in the first 10–15 minutes, but since dad was good at his favourite game, he’d still be playing his first or second quarter when we ran out. The arcade owner was a friendly guy who’d give us free licorice when we got bored of waiting for dad to finally finish. Those Saturday mornings were good memories. Finally, around the mid-80’s, the NES became the hot item and my friends and I would pool our allowance and paper route money to rent a console and try to beat Super Mario Bros in a weekend. A little later, it was the Sega Genesis and NHL hockey. I spent a lot of time leading the Canucks to the Stanley Cup in full season mode. As a young adult, I stopped gaming for a number of years. It seemed I always had more interesting things to do and I was bored of NHL hockey. That was until the first Playstation came out. I’d consider that the pinnacle of my gaming experience. I spent a lot of hours in my early twenties playing Tomb Raider, Final Fantasy, Gran Turismo, and a lot of Madden football (I switched favourite sports in the early 90s). And my core group of friends would get together for a lot of nights of GoldenEye (still one of the best group games I’ve experienced). I share all this because games were a part of my walk with Christ. It was during this period in my early twenties that my first marriage fell apart. And as we had two children, I suddenly felt the need to evaluate where I was in life and what had led me there. And while marriage involves two people, God showed me the part I played in failing my wife and children. Selfishness was the root issue. And video games were a core part of where I invested my energies. So I quote the apostle Paul in the heading above because I realized that games and movies and the pursuit of entertainment were how I focused on pleasing myself above all other things. This is not a judgement: I’m not against video games. As with many things, it’s the dose that causes problems, not the substance itself. But for me, I decided this was a part of my self-focused childhood that needed to be left behind. As God led me to himself, as he slowly transformed my heart to enjoy the taste of heavenly things, I began to leave behind some of things that used to take my time and energy. And games was one I dropped completely. That was some 20 years ago. But here I am with a new family, including 4 children between 14 and 8 years old. As they go to school and spend time with other children, gaming is a subject that had become much more prevalent over the past 3–4 years. Parents in 2018 have a lot of choices to make regarding screens and their children. How much is too much? What should they be able to watch, play, consume? How do we track it? Stay involved? These are very common questions. My wife and I prayerfully consider these questions constantly (for ourselves as well). Slowly, we let gaming into our home a little at a time. We purchased some games for the Mac App Store. Then a couple for the Apple TV. Finally, we picked up a used Wii last summer. The kids enjoyed them all, but as is the way of these things, there was always something better out there. When your console is two generations behind, you’re the odd kid out (although not quite as weird as the kids who don’t have any at all). Finally, we got a Nintendo Switch this past spring for one son’s birthday. I’m not ready to let my twelve-year-old play Call of Duty. And likely never will be. But I do believe there are some quality games available that can be a shared experience. For our family, that is playing Nintendo games. We have a lot of fun playing Mario Kart as a family (we’ll have tournaments occasionally). And my boys and I are all greatly enjoying Zelda: Breath of the Wild. We can’t play it together, but we sure enjoy sharing where we’ve explored during screen time. As many of us face these hard decisions, I thought I would share what led me to the decision to where we are today. First, I wanted to join my children in what they’re doing. I’m not the best when it comes to dropping everything and saying yes when my children ask me to play. I’m getting better, but that’s likely because play has morphed into playing basketball more than make-believe. At any rate, if my kids were going to seeking out games, I’d rather be involved and aware of what they’re doing instead of them trying to fulfill that desire at any one of their friend’s house. And we’ve found just that with Nintendo. If a case can be made that video games can be “good for us”, then I think Nintendo is making those kinds of games. There’s a focus in their games that goes beyond mere violence. Most of us are familiar with the various options of the Mario universe and I can say I don’t feel bad about my kids playing them. Or playing them myself. 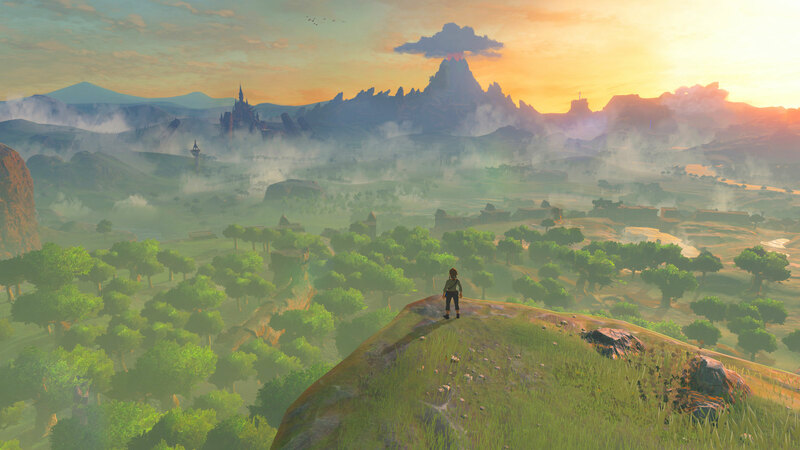 But I’d like to take a moment to sing the praises of Breath of the Wild. For some reason, I never tried any of the Zelda games over the years. But the latest version for the Switch is one of the best games I’ve ever played. The content is clean and friendly for all the ages in our home (yes, you fight monsters — but it feels very cartoonish and non-threatening). The landscapes are lush and graphically stunning. The mechanics of the gameplay just feels good. But what has impressed me the most is that there’s so much to this game: it’s a large world that encourages exploration. It reminds me a little of the Final Fantasy games of my younger years. Large worlds, goals to accomplish, weapons to find, spells to learn. But Breath of the Wild is much more enjoyable because I’m not just pointing characters around and making text-based decisions. Instead, I climb trees and mountains, swim in the rivers, and fight the bad guys by hand. And that’s not all: you spend your time hunting and foraging, then cooking meals and elixirs. You have to think about supplies and starting fires and having appropriate clothing. All in all, I believe this game is more wholesome than a lot of options and it has a touch of realism to it. There have been a number of conversations where my wife has had to take a few moments to realize the topic was a video game. Back to the larger topic, I do have some concerns about games in general. The second concern is the sheer amount of time. I was surprised the first couple of times I played Zelda (again, it has been some 15 years since I last experienced this type of game) by how time flew by. I’d say to myself, “I’ll just finish this shrine trial” and then be shocked that 45 minutes has gone by. We’ve only had this game for 5 weeks, but I’ve probably played around 10–15 hours of it so far. We all have to decide how much is too much. But it is something to be evaluating regularly. As with everything, we try our best to find balance as parents. Both for ourselves and for our children. For now, we’re really enjoying playing and talking about this game. Tomorrow? We’ll see.